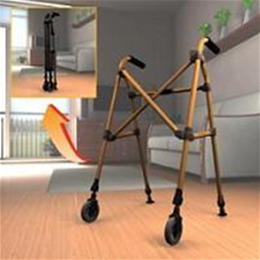 ONLY 19" WIDE - When unfolded, the metro walker is only 19" wide, making it easy to fit through tighter spaces for increased maneuverability! * Portable - Quickly and easily folds up for storage in small spaces. * 4” Urethane Wheels & Rear Easy-Glide Feet - Allows for trouble-free maneuvering over all surfaces. * Patented Height Adjustment - Innovative mechanism allows for easy touch variation. * Contemporary Look - Three stylish colors to choose from. Regal Rose, Artesian Amber, and Black Walnut! * Height Adjustment: 32” to 36” for users 4’10” to 6’8”.